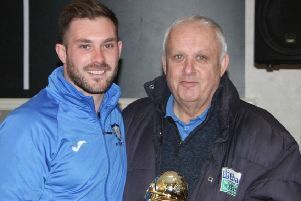 Percy Main’s latest win against fifth placed Ponteland United means the Villagers need just one win from their remaining five games to clinch promotion back to the Northern Alliance premier division at the first attempt. And although no one is counting their chickens, it would take a near miracle to slip up at this stage of the season. Any concerns the team may have lost their way following three defeats during February have been banished by impressive back to back wins over much different opposition in the shape of AFC Newbiggin and Ponteland, both have shown that they too have what it takes to be involved in the promotion shake up at the season’s end. The latest win was more workmanlike than spectacular, but the luxury of an early lead settled any nerves. The management team elected to go with the same side which had finished the game against Newbiggin, and once again it was Joe Betts, who on as a second half substitute, had helped turn the tide the previous week and broke the early deadlock with a superb strike. There were only five minutes played when Stew Wright was upended on the edge of the area and with dead ball specialist McKee hovering over the ball, Betts fired an unstoppable free kick beyond the reach of Stuart Taylor in the Ponteland goal. It was just the start Percy Main had hoped for, and when Redmond Cockburn narrowly headed Adam Green’s cross over the bar minutes later, it looked as though Main were poised to take control. But Ponteland had other ideas, Chris Hibbitt crossed for Wayne Dunn who half-volleyed wide, Gary Cook saw his cross cut out for a corner and Main appeared to have a let off as the visitors had a decent penalty shout turned down when Cockburn appeared to impede the on-rushing Zachary Bewley in the area. Main, though, had three decent chances to increase their lead. Wright saw his goal bound effort impressively tipped behind by Taylor, Betts played in by Sneap fired a low shot just past the far post and the visiting custodian earned his corn once more as Betts found Green with a superb cross-field pass, but Taylor raced from his line and saved once more. The pressure eventually told and the visiting defence found itself breached for the second time as Sneap latched onto a loose ball and ran on to execute a superb finish past the goalkeeper for his 15th goal from 20 appearances this season. Ponteland exerted a spell of pressure on the home goal at the start of the second half and when Bewley’s right wing free kick was headed against the crossbar by Hibbitt, with the loose ball scrambled away by the grateful Main defence, it appeared that luck may have been on their side. The second half failed to live up to the first with clear goalscoring opportunities at a premium. Main’s Ryan McKee, played in by Green, executed a smart turn and fired over the angle, while at the other end Ian Mulroy saw his 20-yard effort competently saved by Rob Rodgerson in the home goal. Cockburn and McKee for Percy Main fired over Taylor’s crossbar, but there was drama in the closing seconds as Ponteland’s Cook was adjudged to have been fouled in the area by Green and a penalty was this time awarded. Cook himself stepped up to take the kick but he blazed well over. Percy Main have no game this Saturday and will return to action on March 28 with a visit to Blyth Isabella.